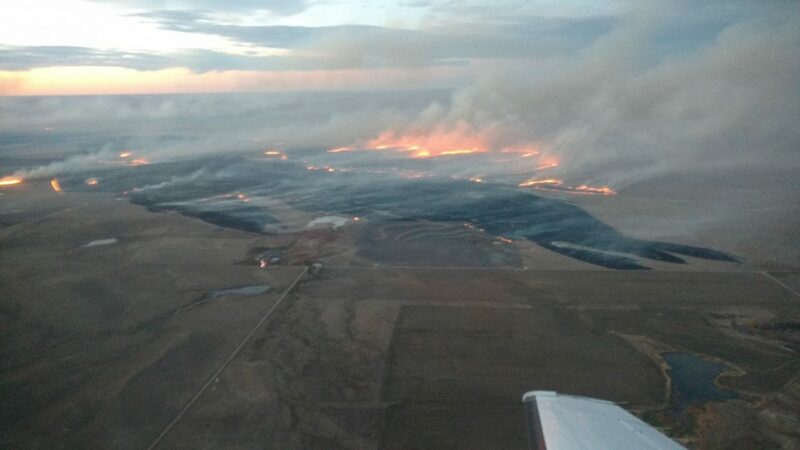 Wall, S.D.- Just before 1 pm yesterday, October 16, a wildland fire was reported 11 miles east of Wall, SD. The area was under a Red Flag Warning at the time for low relative humidity, high winds and high temps. Under these conditions, the fire spread quickly. This release represents the most accurate information as of 9:00 am MDT. The fire is currently being managed by the Pennington County Type 3 Incident Management Team (PCIMT3) and is under Unified Command. Brian Daunt of the Buffalo Gap National Grasslands is in command for the October 17 day shift. Additionally, Wall, S.D. Fire Chief John Kitterman, Jackson County Emergency Manager Joshua Nisen, and Rob Lehmann of the Pennington County Incident Management Team are also commanding the incident. The PCIMT3 took over management of the fire around 6 pm MDT last evening. The fire is called the Cottonwood Fire. The fire is currently located 11 miles east of Wall, SD to 10 miles south east of Cottonwood, SD and north of I-90. The fire is currently between 5,000 and 6,000 acres. This mapping was done by aircraft at 6:00 pm last evening. More mapping will take place today and will very likely change the original acreage estimate. The fire is currently 50% contained. As of this morning, we can confirm that structures have been destroyed. As of 8:30 pm last evening, it became unclear whether any primary residences are among those structures destroyed. There are a number of structures still threatened. Today we will focus on verifying losses. Additionally, we will work to verify whether livestock losses have occurred as a result of this fire. In addition to structures being lost, power lines were damaged during the fire. A power outage has occurred in the area. Rural Electric Cooperatives are working to resolve the issue. It is not known as of this time whether any outages remain. 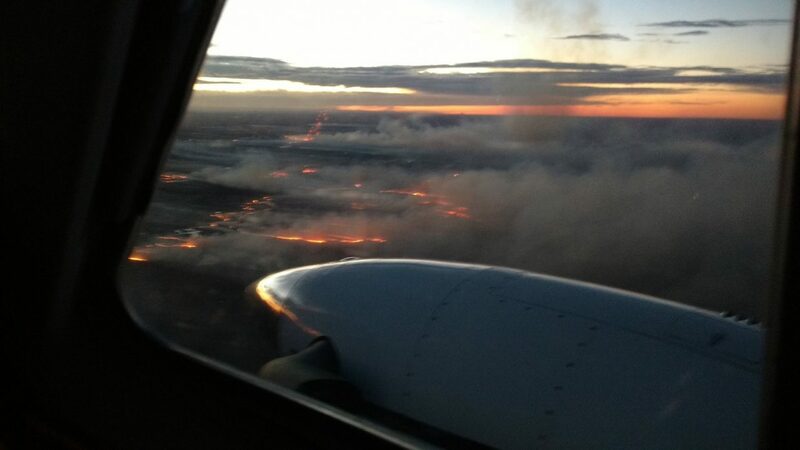 The PCIMT3 has received two separate reports of bridges impacted by the fire. Motorists in the area are encouraged to utilize caution although no hard road closures are in effect. 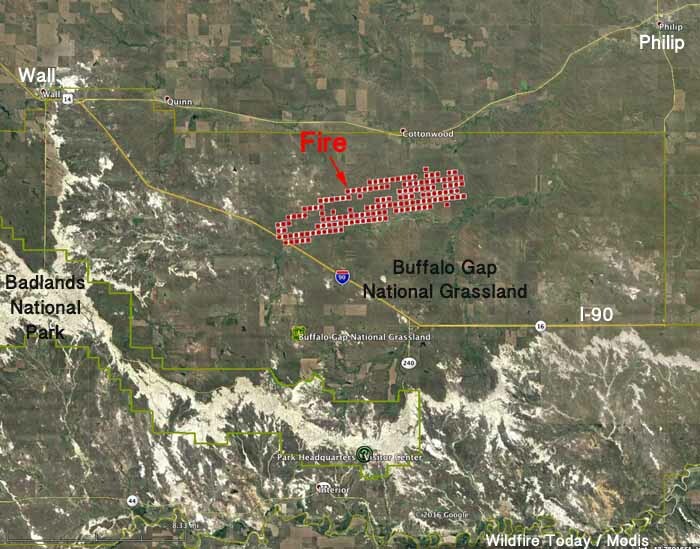 The fire is burning on private land as well as the Buffalo Gap National Grassland. There are no road closures in effect at this time and I-90 currently has no restrictions in the fire area. Motorists on I-90 are asked to use caution as visibility from smoke may cause intermittent decreases in visibility. The fire area will be clearly visible to travelers on I-90. Drivers are asked to remain alert and do not be distracted by the fire. Additionally, there is a high volume of emergency vehicle traffic between Kadoka and Wall on I-90. Travelers in this area should remain alert for the increased traffic. There are currently nearly 100 personnel working on the fire. At its peak, close to 300 firefighters were fighting the fire. Firefighters from 10 Western South Dakota counties came to assist. Pennington, Lawrence, Meade, Custer, Haakon, Jackson, Jones, Mellette, Bennett, and Stanley Counties sent resources. The majority of these firefighters were area volunteers. This highlights the "neighbor helping neighbor" mentality of South Dakotans. It also showcases interagency cooperation between Federal, State and Local resources. The focus for today's operational period will focus on continued improvement of containment lines. Firefighters will also work to increase containment. Structures remain threatened. Firefighters will work to continue to defend those buildings and mop-up around structures that were successfully protected. The Incident Management Team will work with local emergency management to assess the number and type of structures damaged or destroyed. Emergency management and PCIMT3 members will also work to confirm livestock losses, damage to infrastructure and improvements. The American Red Cross, serving Central and Western South Dakota, has been on scene all night providing rehabilitation for firefighters. They are prepared to transition into a disaster relief and recovery role. The point of origin has been located and the fire has been determined to have been human caused. An investigator has been requested and the fire will remain under investigation. An additional written update will be released at 4:00 pm MDT. Periodic updates can be found by following the PCIMT3 Twitter feed, @PennCoIMT3. 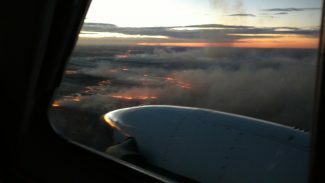 The Cottonwood fire near Wall, South Dakota, from the air on Sunday, Oct. 16, the day it started amid red flag conditions--high winds, high temperatures and low relative humidity. Photo by Ray Bubb, SD Wildland Fire Division. Wall, S.D. – Just before 1 pm today, October 16, a wildland fire was reported 11 miles east of Wall, SD. The area was under a Red Flag Warning at the time for low relative humidity, high winds and high temps. Under these conditions, the fire spread quickly. This release represents the most accurate information as of 8:30 pm MDT. Additional releases are not anticipated this evening unless conditions warrant. A media briefing will take place at 7 am MDT at the Incident Command Post located at the Minuteman Missile Visitor Center just north of I-90 at Exit 131. The fire is currently being managed by the Pennington County Type 3 Incident Management Team (PCIMT3) and is under Unified Command. Brian Daunt of the Buffalo Gap National Grasslands, Wall, S.D. Fire Chief John Kitterman, Jackson County Emergency Manager Joshua Nisen, and Rob Lehmann of the Pennington County Incident Management Team are commanding the incident. The PCIMT3 took over management of the fire around 6 pm MDT. 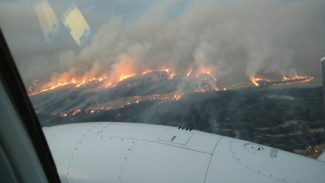 The fire is currently between 5,000 and 6,000 acres. This mapping was done by aircraft at 6:00 pm. More accurate mapping will take place tomorrow and may result in changes in acreage. The fire is currently 0% contained. As of 8:30 pm, we can confirm that structures have been lost. As of 8:30 pm, it is unknown whether any primary residences are among those structures lost. There are a number of structures still threatened. In addition to structures being lost, power lines were damaged during the fire. A power outage has occurred in the area. Rural Electric Cooperatives are working to resolve the issue. The PCIMT3 is aware that a vehicle crash occurred during the fire in the area of mile marker 125. The extent of injuries is unknown to the team at this time. The fire is burning on private and Federal land. There are no road closures in effect at this time. Motorists on I-90 are asked to use caution as visibility from smoke may cause intermittent decreases in visibility. The fire will be clearly visible overnight to travelers on I-90. Drivers are asked to remain alert and do not be distracted by the fire. Additionally, there is a high volume of emergency vehicle traffic between Kadoka and Wall on I-90. Travelers in this area should remain alert for the increased traffic. Close to 300 firefighters are working on this fire. Firefighters from Pennington, Lawrence, Meade, Custer, Haakon, Jackson, Jones, Mellette, Bennett, and Stanley Counties are on scene. Suppression activities will continue throughout the night. The next media briefing will occur at 7 am. The next update will not occur until that time unless significant activity occurs.